A sunken gravestone at the Holten Street Cemetery in Danvers. DANVERS — Samuel Holten was such a zealous Revolutionary War-era patriot, and such a notable early American statesman, that the street where he lived and the cemetery where he lies still bear his name. But history has not been kind to Holten Street Cemetery. Many of the granite, limestone, and slate headstones that line the 1.5-acre graveyard are broken in half, spotted with lichen, or obscured in the unruly brush. Empty beer cans nestle in the shaggy grass, shrubs and fruit trees grow wildly, and a retaining wall is crumbling into a brook. This state of dilapidation is all the more disheartening because there is no one to blame. The trustees of the private association once responsible for the cemetery have all died, leaving the historic plot without funding for maintenance. This has thrust the town into an uncomfortable legal and moral dilemma: whether to pay up and take over what is still a private plot in order to preserve its ancient bones. Throughout the 19th and 20th centuries, members of some of the town’s leading families ably managed the cemetery association, building an endowment for maintenance through the sale of hundreds of burial plots. A toppled gravestone at Holten Street Cemetery. But last December, Susan Ortins paid a visit to town hall with distressing news. 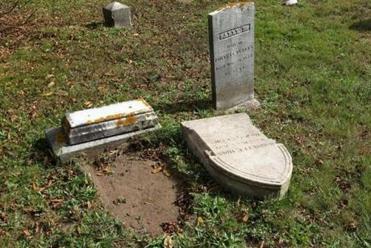 Her father, a former selectman, had served the association until his death, but without new trustees, responsibility for the cemetery had fallen to Ortins. Visibly upset, she described how she had honored her father’s wishes by arranging for a contractor to regularly mow the cemetery lawn and see to other basic maintenance, according to Bill Clark, chairman of the Board of Selectmen. But the association had long ago sold out all its burial plots and had no other means of raising funds, Clark said. Ortins, who declined to be interviewed, told town officials that she could no longer administer the association on her own, so she presented a check for its remaining funds, more than $18,000, and asked the town to take over, Clark said. “It was a very, very difficult situation,” he said. The town, however, has no legal obligation to take over the cemetery, and the check remains uncashed, Clark said. “But we have a moral obligation to do it, because of the number of veterans buried there and the historical nature of it,” Clark said. About $14,000 a year may be necessary for upkeep, not counting major repairs, like righting retaining walls, he said. But the elegant old stone is fading and tilted, and grass grows unbidden around it. Holten, a judge and physician, served in the Massachusetts Legislature, and as a member of the Sons of Liberty, the secret society that agitated for independence and included Sam Adams, John Hancock, and Paul Revere. Holten served in the Continental Congress, and signed the Articles of Confederation, the country’s first constitution. “Samuel Holten was a pillar of the community in that era,” Clark said. He is not the only American of note to be buried at Holten Street Cemetery. Trask, the town archivist, said veterans of every US war lie there. Thomas Lang, who grew up in Danvers and saw combat in Vietnam as a Marine, returns regularly to the cemetery to stand over the graves of his parents and grandparents in remembrance and gratitude. His father, he said, put his life on the line in the Navy in the Pacific in World War II. On his most recent visit in August, Lang, who is 67, said he was so “discouraged and disgusted” by the cemetery’s unmowed grass — “it looked like a wheat field” — that he loudly protested in an emotional outburst at Town Hall. 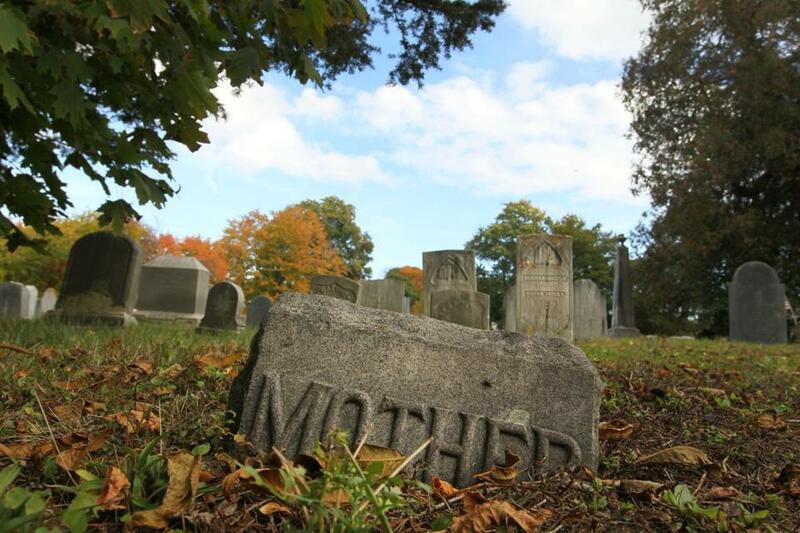 Whether Danvers will take over the cemetery is likely to be decided next spring, during the annual Town Meeting. But Rick Lavallee, 62, another local resident, said taxes should be used only as a last resort. “Some private organization should step up,” he said. 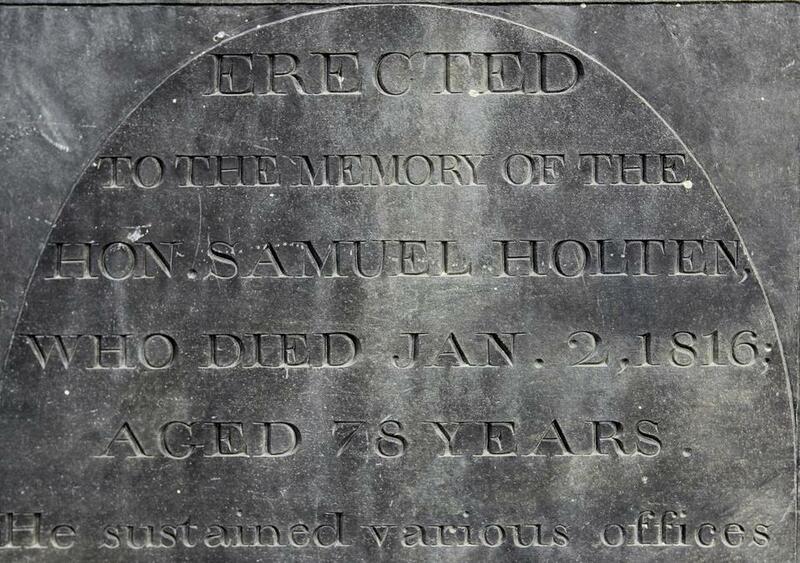 Samuel Holten’s gravestone still stands at the Danvers cemetery that bears the Revolutionary War-era statesman’s name.